As near as I can tell, the DeRoux Spur Trail was built around 1936 or 1937. 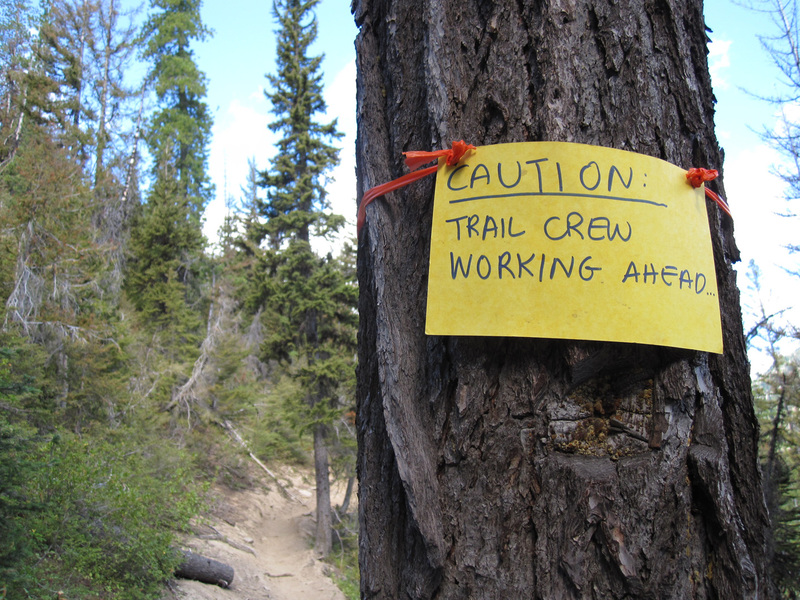 That’s when the Forest Service laid out a route that followed a 10% grade up a steep sideslope, over a ridge, and down to the Middle Fork of the Teanaway River. Prior to this new construction, herders drove sheep straight up and over. From old photographs, I can tell that the country had all burned around the turn of the 20th century, so forage would have been plentiful. During the past 70-something years, the trail has seen heavy traffic, mostly horses. The soils are unstable, always drifting down the slope with gravity. The trail has slid and slumped, growing narrower and more precarious. 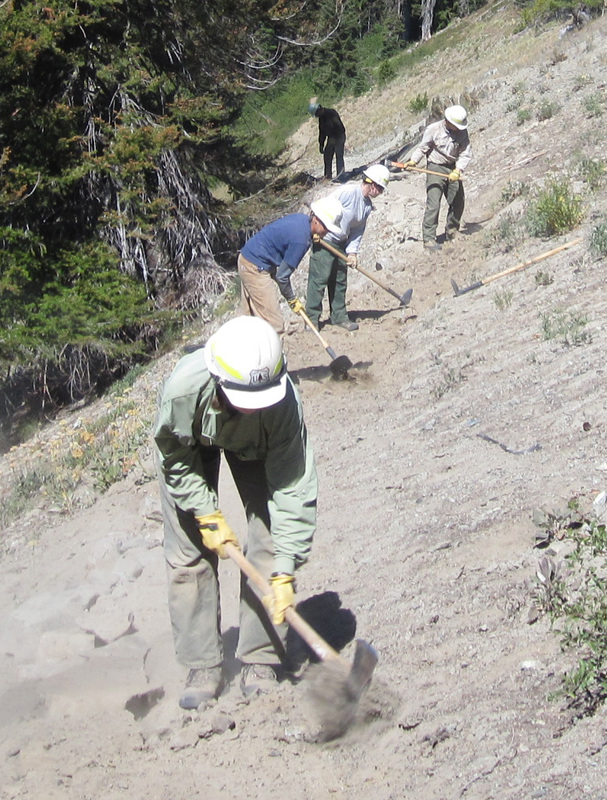 We have tried various fixes, from installing log cribbing to blasting rock from the backslope of switchbacks. What we have learned is that tread stabilization techniques are fairly successful. The trail needed a makeover. We applied for a grant to do the work, and were given $30,000 to fix it up. We started last year, and have the rest of this field season to finish. This past week, we tackled the tread furthest from the road. Every morning we hiked the 2.5 miles from camp to the work site. Cribbing is a way of stabilizing the downhill side of a trail, where it tends to be soft and slumpy. We like to dig a shallow trench and place a single or double course of rocks. It’s also possible to use a log and secure it with wooden stakes pounded into the ground. You use whatever is easiest, but rocks last longer. 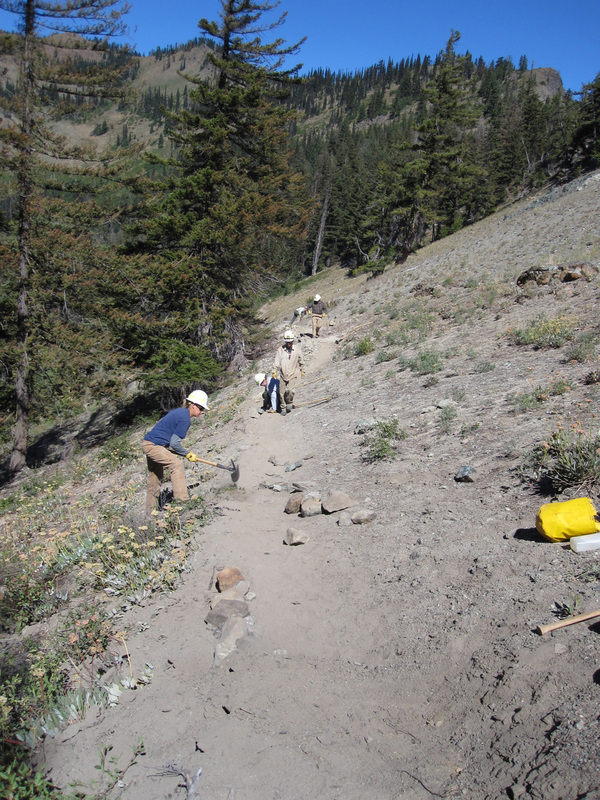 The backslope on the uphill, or cutbank, side of the trail is excavated, and the dirt pulled over the cribbing to create a bench-like tread. Ideally tread should be about 24 inches wide. It’s a process, and the crew has gotten pretty good at it. Cooperation is necessary, with some people gathering rocks, others digging the trench and placing the rocks, and finally everyone gets to excavate. As digging proceeds, the ground has surprises for us. Outcrops are revealed, and the pick-mattock specialist (Jon) bashes the crumbly serpentine rock to smithereens. Sometimes there are roots to be dug out and cut. It was hot and dusty. When our brains had baked enough in the sun, we crawled to the nearest shade to swill water. Then back to it. After the end of two days, we had completed 810 feet and felt the righteous satisfaction that comes from knowing we have made the trail a safer and more sustainable travel path for the recreating public and their livestock. And the view from the office wasn’t bad. I swear I thought I might have got myself lost, maybe gone through a time warp, and come out in Yosemite. 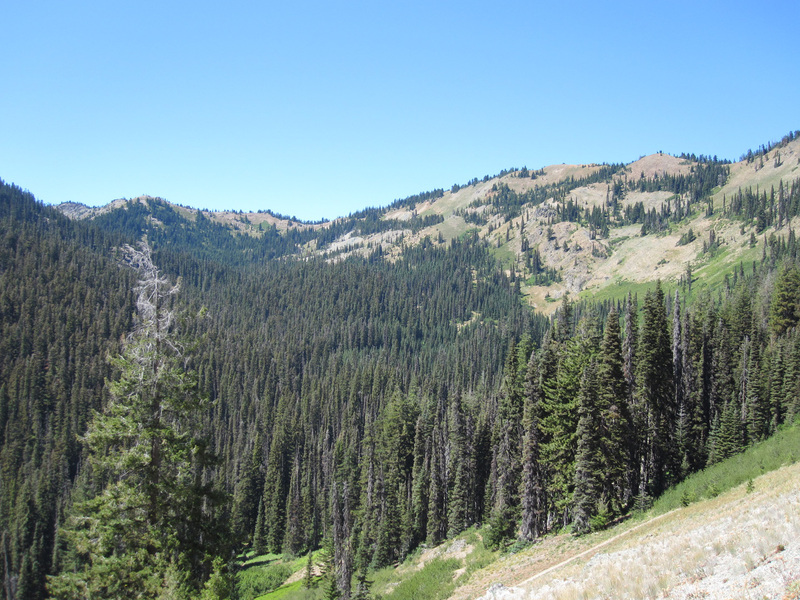 I mean, the Teanaway has Mount Stuart instead of Half Dome (and we might have got the better deal on that one, between you and me), but the open forest was remarkably similar. And that big, warm, yellow thing in the blue sky! I didn’t realize the Teanaway was wildflower country. It makes sense. Unlike the west side, sunlight actually reaches the ground there. I just told my boss I need a few days to go back and explore. I think I left my heart in the Teanaway, and I have to go back for it.